Some scammers are taking advantage of the popularity of job opportunities to Japan. 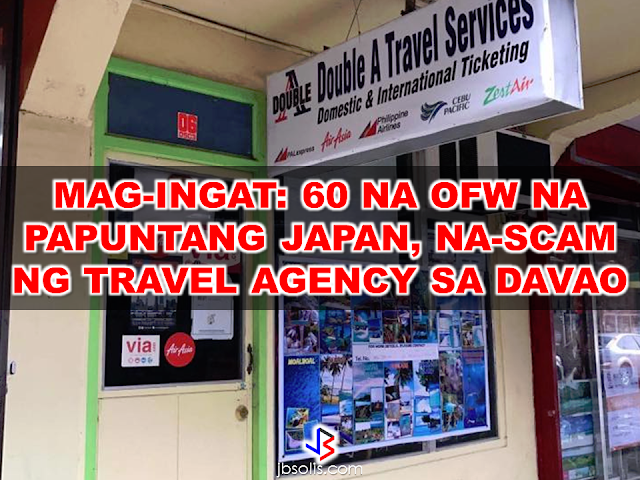 Sixty OFWs who are supposed to travel to work in Japan has been victimized by a fraudulent travel agency in Davao City. Their tickets was booked on January 5 but the owner of Double A Travel Agency, Arlyn Llurca Palantar failed to provide the payment ,thus, the 60 OFWs could not travel to Japan for their deployment. The travel agency owner got away with over P800,000 from the victims. Double A Travel Agency was located at Door 6, Doña Segunda Building, Davao City but when the victims went there with the police, it was already closed down. Alvin Zulueta, one of the scammed passengers, said they were supposed to fly from Davao City to Manila on January 6 at 9:20 a.m. and from Manila to Narita, Japan at 2:50 p.m. but they found out at the airport that their flight was not booked. Zulueta Said that they were doing transaction with the same travel agency before and it is the first time that it happened. The police investigation found out that the travel agency's accreditation with Department of Tourism was expired since 2015. Meanwhile, OFW remittances from Japan increased by 11.5 percent in 2016 to reach $1.4 billion, comprising 5.1 percent of the total remittances of $26.9 billion for the year, after dropping 14 % on the previous year, according to the Philippine Central Bank data. “Since remittances are reported in US dollars, remittances from Japan when converted to US dollars increase as the yen appreciates,” Rosabel B. Guerrero, the director of the Central Bank’s department of statistics said. “Another factor that could contribute to higher remittances is the increase in the number of overseas Filipinos remitting to the Philippines,” Guerrero added. A steady increase of Filipino workers in Japan has been recorded annually from 2010 to 2015, but the government tally of the total numbers are yet to be completed. According to Philippine Overseas Employment Administration (POEA), the number of Filipinos working in Japan increased 10.5 percent in 2015, despite accounting only for 1 percent of the recorded total deployment. “The increase in deployment could be due to increasing demand for foreign workers to fill in the labor shortage,” Guerrero added, citing reports that Japan is looking to fill in more jobs through hiring foreign labor force including OFWs. In 2016, remittances from Japan ranked as the second largest remittance to the Philippines by workers in Asian countries, surpassed only by those from Singapore, where remittances reached a total of $1.7 billion. Remittances from the United States were highest at $8.9 billion, followed by Saudi Arabia at $2.6 billion and the United Arab Emirates at $2.2 billion.